I was always a die-hard elliptical fan, but I knew I wasn’t pushing myself. A self-proclaimed “non-runner”, I was jealous of those that casually went out of their daily run. Over Thanksgiving break of 2009, I decided I wanted to run, so I went outside and ran for 30 minutes. I have no idea how far or how fast I ran, but I did it! I kept setting new mileage goals for myself (3…4?!) and ran a 5K in the beginning of December. I finally decided I could sign up for a half marathon that April with my best friend LB. I got a Garmin for Christmas and started a training plan. 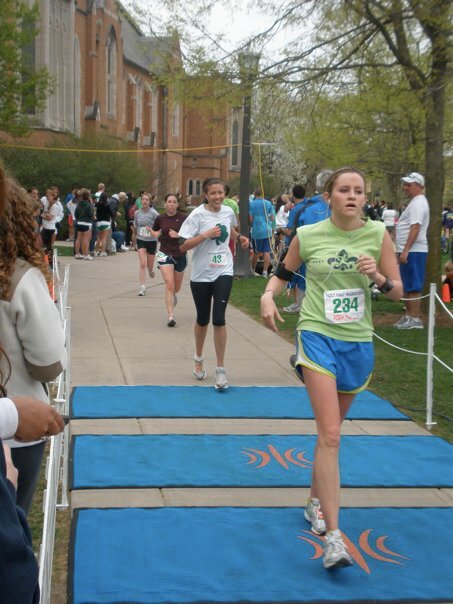 I was SO PROUD when I finished that race! My time was 1:49:36, but unfortunately the race was only 12.66 miles according to my watch! I was annoyed. Still am. But I count it. Now I include running in my weekly workouts and am excited for the upcoming race season! I also started Bikram Yoga over Christmas break of 2009 and got hooked. It was a completely new challenge for me mentally and physically. After each class I felt stretched, strong, cleansed and accomplished. Bikram class was actually the first time I looked at my legs and thought they looked strong. I have always hated my legs. There wasn’t a Bikram studio near school, but I started again when I moved back home. Currently I try to do Yoga twice a week, get in training runs, do some cross training and strength training, and give my body rest when it needs it. FITTING IT ALL IN. Added April 2010: I’ve now completed my first full marathon! Here is a post the describes my entire marathon experience in detail. I’m looking for a Bikram Yoga place in St. Louis, but have only found one place that offers a decent amount of classes. Any suggestions would be greatly appreciated!